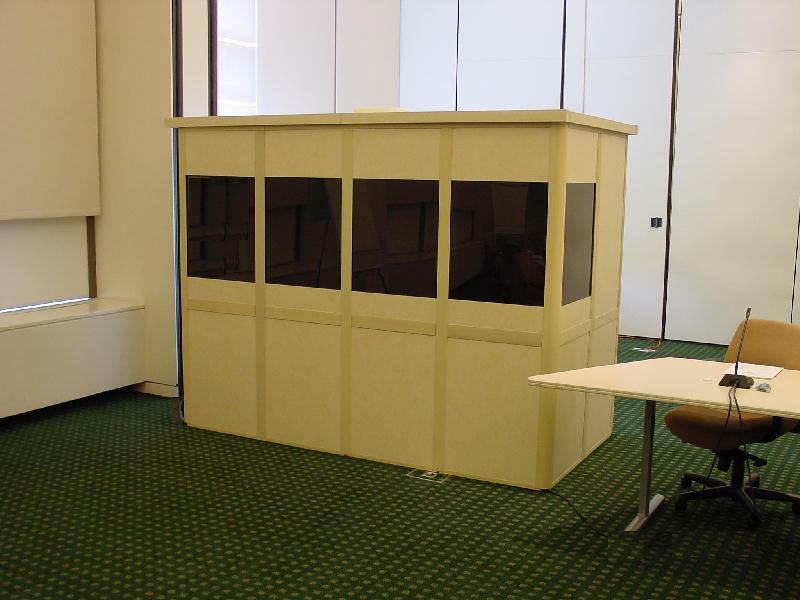 Our Interpreters Isolation Booths are designed to provide separation between Interpreters and conference proceedings. They are designed with neutral colors to blend into any meeting or conference room decor. 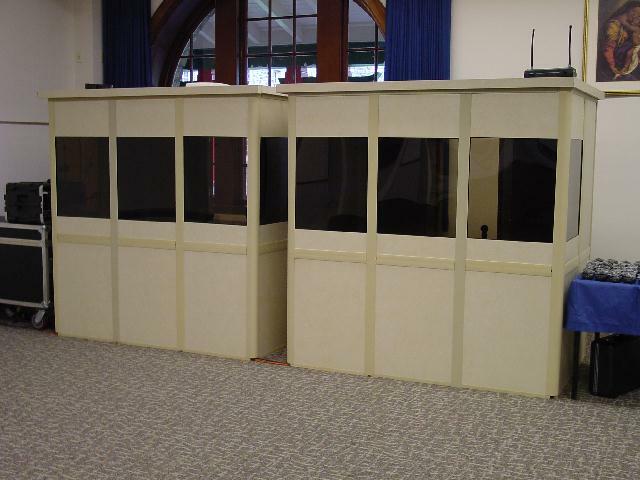 The booths are modular and can be configured for one, two (typical) or three interpreters. Flexible configurations allow customized configurations depending on room setup and available space. Double pane tinted windows allow interpreter privacy and excellent isolation from room 'noise'. GEN-01 - One Person Booth 50" 50" 72"
GEN-02 - Two Person Booth 72" 50" 72"
GEN-03 - Three Person Booth 96" 50" 72"
The majority of events require one Interpreters Isolation Booth (GEN-02). 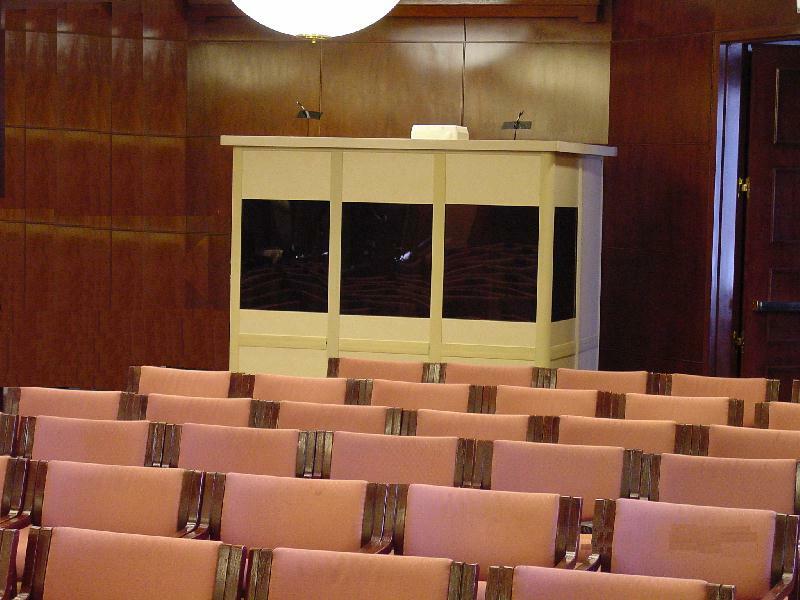 The booth is typically situated within the conference room where it is unobtrusive, yet positioned in such a way to offer the interpreters a view of the conference proceedings as well as any data, video or slide projections. Shown is a 2 person booth on the left and a 3 person booth on the right. The Interpreter Isolation Booth Interior incorporates a working surface that spans the entire width of the booth. The table allows ample space for the interpreters unit (SX-P700), Microphones, dictionaries, reference books and conference materials. The interior walls incorporate an acoustical sound absorbing wall covering that filters out room noise and also allows the interpreters to work in a comfortable environment. The Booth also provides a halogen desk lamp for each interpreter and an electrical outlet for interpreters use. Interpreters typically use outlets for Laptops, Electronic Dictionaries and Cell Phone Charging. An English - Spanish - French Conference discussing Humanitarian Rights. 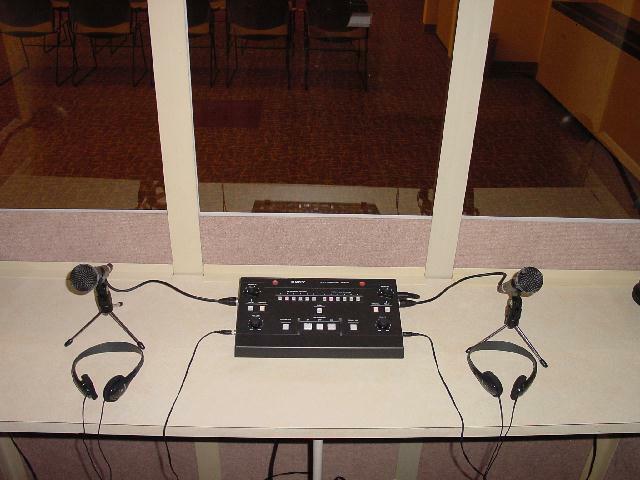 Since the floor language changed between the three, equipment capable of 'relay' interpretation is essential. 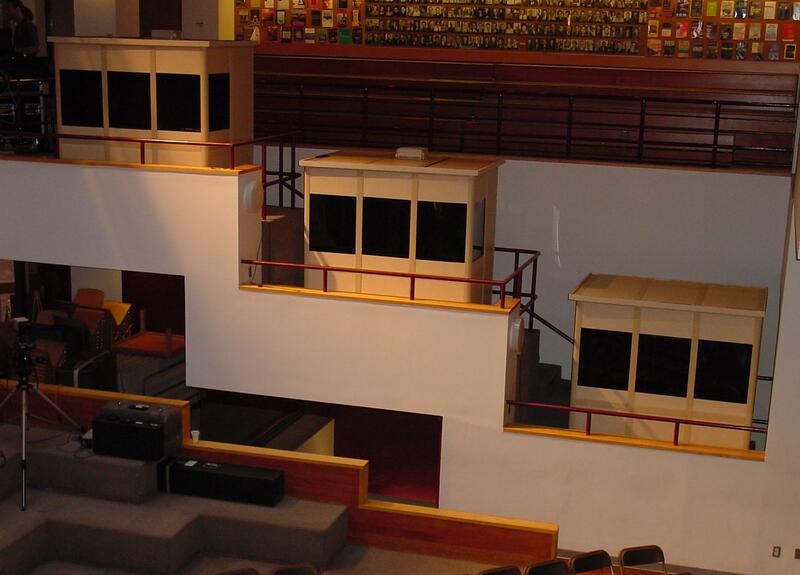 Interpreter Isolation Booth within a 100 person auditorium for a Georgian - English Press Conference for the Georgian President Eduard Shevardnadze at Harvard University. 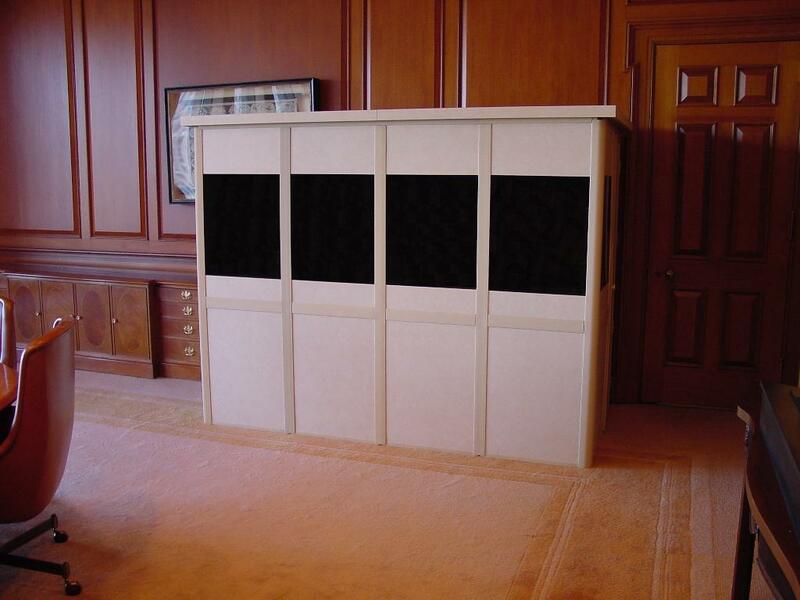 A three Interpreter Isolation Booth is typically required for Japanese and Chinese meetings. Due to the complexity of the languages, Japanese and Chinese Interpreters usually work in groups of three instead of the traditional pairs. A three booth setup at the Ritz Carlton in Pasadena California for a consumer product safety conference. The interpreters were relieved to be working in comfortable booths with active air circulation. All of Global Equipment Networks booths incorporate quiet fans into the roof of the booth. A unique three booth setup at Harvard University. The event called for Four languages of Interpretation (English, French, Portuguese & Spanish). The event took place in their World Renowned Forum. 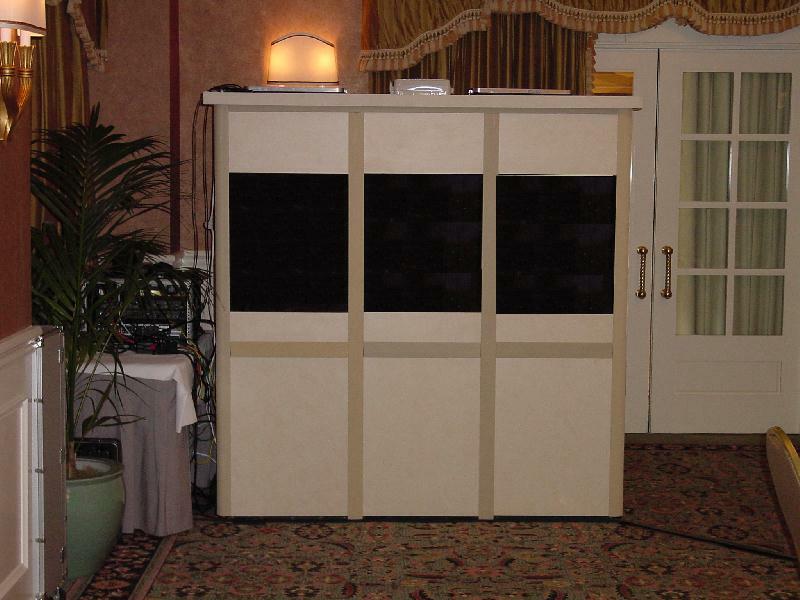 A FM Wireless Interpretation System was utilized as the room was set up in an Auditorium Style. Fixed Aisle Microphones were utilized for Q&A Sessions. At the right is a seven Interpreter Isolation Booth (GEN-02) setup at the Philadelphia Convention Center for an 8 Language Conference. The event was for a two day conference for a travel agency. 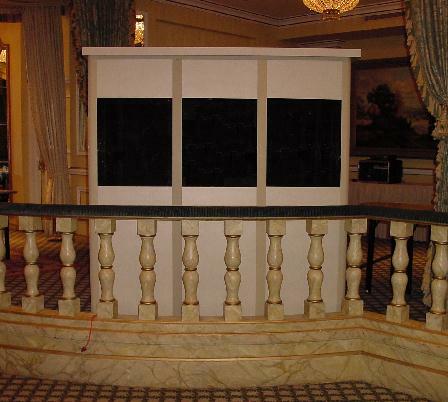 The client admired the booths so much that they put them at the entrance to the facility so all of the guests were aware they were at an international event.